It is still insufficiently recognised that hypnotics and anti-anxiety drugs are one and the same and that the regular intake of these drugs will be followed by withdrawal phenomena, including complaints of insomnia and anxiety. 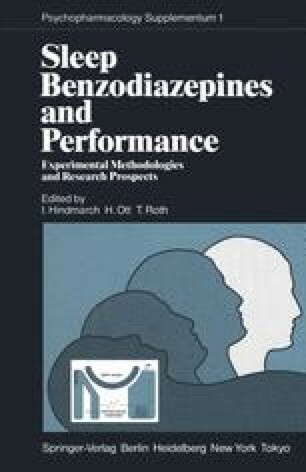 The long-acting, cumulative drugs like phenobarbitone or flurazepam cannot in reality be withdrawn abruptly owing to their persistence in the tissues, and so they do not cause sharp rebound phenomena, though they cause impaired skills and judgement by day. Very short life drugs, like triazolam, are followed by immediate and severe withdrawal insomnia in older people and their regular nighttime intake may cause regular daytime withdrawal symptoms of enhanced anxiety. A hypnotic with a half-life of about 10 hours may be the most sensible compromise to provide sleep by night without serious positive or negative daytime effects, though some eventual withdrawal features will be inevitable. The benzodiazepines lead to a degree of tolerance, but this is never complete and their positive effects are sustained over many months. Increased sleep duration has been assumed to be a necessary feature of an effective hypnotic. However, hypnotic drugs for the future might not lengthen sleep, but improve it’s restorative value and the subjective satisfaction given to the patient.